The widget will be shown to these of your online store visitors that will try to exit the website (directing the mouse pointer to the edge of the browser). That gives them the freedom and possibility to get acquainted with your site (better conversion than welcome pop-up). The best conversion we get by offering some advantage in exchange for leaving the email address (discount code, free delivery etc). Set up cookie file expiration (time after which the pop-up will be shown again to your visitor). Choose one of 4 design versions (with image 600x800 pixels 600x200 pixels and 2 without an image). Choose any additional element from the list in top left corner (you can i.e. collect your visitors’ phone numbers). You can edit the text displayed in editable fields (for example change “email” to “email address”). You can also edit the tag being added for the users signing up from this source. By default it is “From PopUp” tag. Click on “Preview” and wait for the pop-up to be generated (do not skip this step) and you can see what it looks like at your store. Click on “Publish” to make it live. Set up the language (if you use multiple languages) and SENDER section. Go to the DESIGN section to use our drag’n’drop creator. Usually you paste ling confirming subscription in the first message and discount code in the second one (if you use the double opt-in option). Insert both elements as tags. Edit the confirmation message first. It is important for it to contain the subscription link. 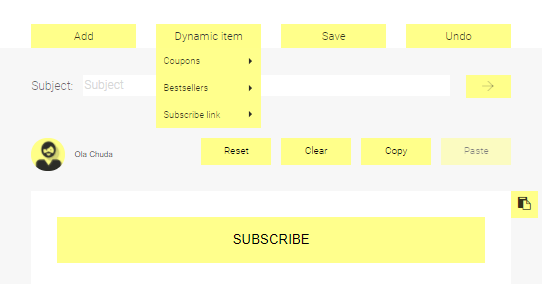 Just choose the SUBSCRIPTION item in text. If you place the *|COUPON|* tag, you need to import DISCOUNT CODES as well. Please send the test message in the REVIEW section and you can run the scenario and grow your database.